If you plan your meals ahead of time, you’ll always be prepared to stick with any diet. It’s typically not a problem for people to stay with a diet that works. It’s more the fact they aren’t prepared for the day and have to rely on something that’s not healthy, especially when they get hungry. 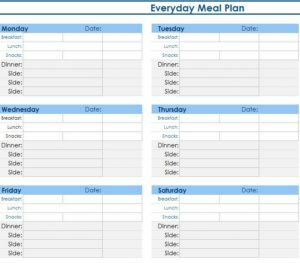 By using the free Daily Meal Planner, you can avoid this by creating a running list of your favorite healthy meals and planning ahead. Making scheduled meals is how you’ll stay ahead of fast food urges. To try this free template today, just follow the link at the bottom of this page. The next step is to start entering entire meals that you’re already familiar with. You will do this in the various sections of the template in the tabs below. There is a space for every meal of the day. When you want to enter your dinner meals, choose the “Dinner” tab. In the same fashion, you will fill out the lunch, snacks, and breakfasts tabs at the bottom of your page too. When you have all your meals planned for the week, you will enter the ingredients to make each meal also. This way, you can buy the items you need on your next shopping trip. The grocery list is located in the “Planner” tab. You will simply go to the store at the beginning of the week and purchase the items on your grocery list. When you’re ready to start your week with these scheduled meals, you will look at the current day to see your meal plan and make that dish. If you want, you can use the spaces to store certain recipes, making each new meal an adventure! This template provides you with the tools you need to break free from the cycle of fast food once and for all.